Here we have the Modern equivalent of a French polish finish, the most difficult finish to produce and mainly used on the more expensive pianos. 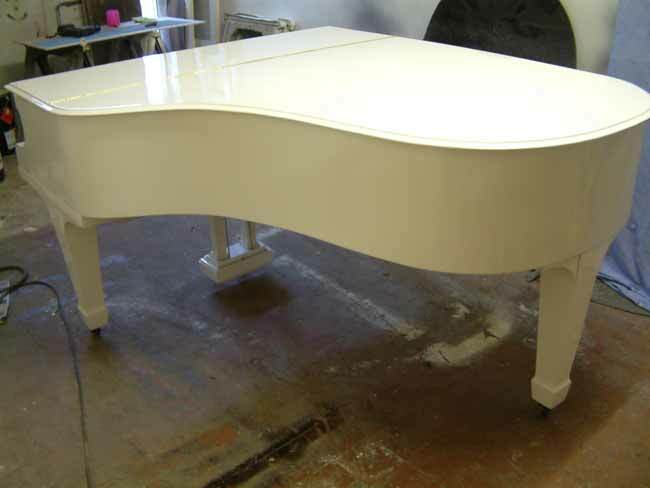 With these Polyester High Gloss lacquers we can change the colour (re-polish) of your Piano, so if your looking for a white, black, blue, grey or a pink piano these are a good choice. Modern spray finishes are also more resistant to water & alcohol and won't scratch as easily as Traditional French polished surfaces. 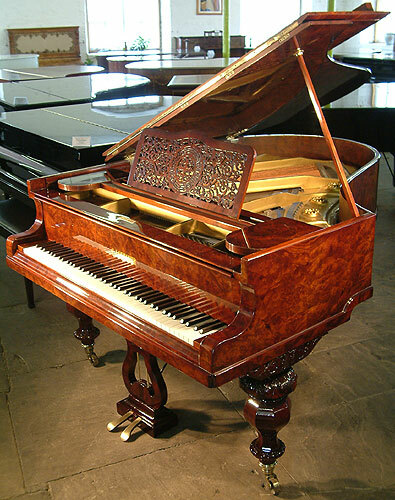 Once the Pianos have been dismantled, stripped (Hand stripped) & prepared we spray them the desired colour, then they need 10 to 15 days drying time for the Polish to be cured enough for us to smooth down and start the Buffing process, eventually producing a High Gloss Piano finish, this process from start to finish takes 2 to 3 months to complete. 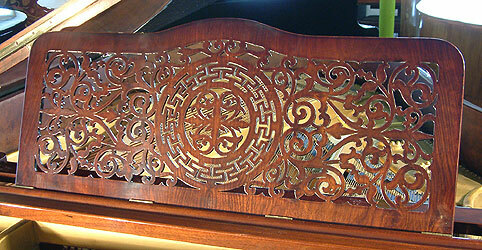 These Piano finishes take approximately 2 to 3 months from start to completion. Note: All Piano Names where needed are replaced with Vinyl Transfers and lacquered over. Click on one of the images below to go to our Piano Polishing Portfolio pages for more photo's of these High Gloss Piano finishes. 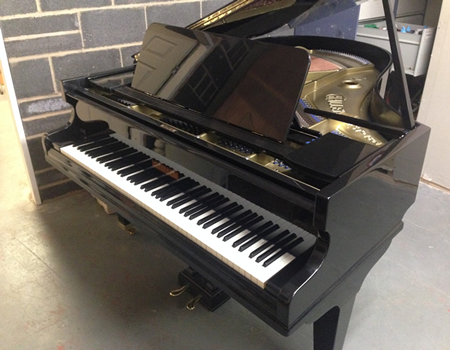 Challen 6ft Grand Piano in a High Gloss Black finish. 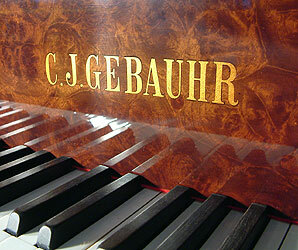 Gebauhr Grand Piano in a High Gloss Walnut Finish. 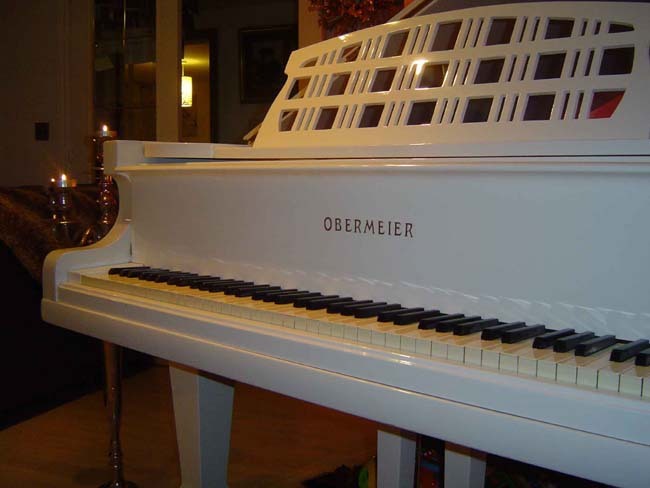 Obermeier 6ft 6in Grand piano in a White High Gloss Finish. © Copyright. The Polishing Shop.